And so, we took it upon ourselves to scour Berkeley and eat obscene amounts of pie, all for your sake, dear reader. Because now, instead of scratching your head and wondering where to find the pie you’ve been craving, you can simply read this! 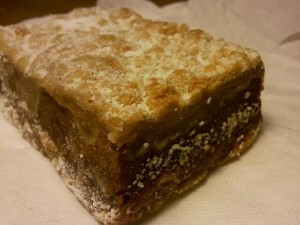 Yes, it can be hard to pass up Caffe Strada ’s sinful “apple clouds,” but if you’re in the mood for something a little more seasonally appropriate, we at the Clog humbly suggest that you opt for a slice of good ol’ pumpkin pie. Seriously, ’tis the season to be gluttons, so maybe even opt for two. Due to the shallow crust creating a more balanced crust-to-filling ratio, Strada’s pumpkin dessert is more tart-like than pie-like. Expect a traditional butter crust that’s quite crumbly (a welcome change from the typical sogginess that characterizes most cafe treats) and a well spiced filling. Each slice is topped with a serving of whipped cream (we somehow doubt that this isn’t freshly made — it tastes suspiciously like Cool Whip, but hey, we’re not complaining). A chat with Strada’s manager, Jose Luis Diaz, revealed that their baked goods are made with plenty of organic ingredients just a building away in the oh-so-lovely Bancroft Hotel. Those lucky hotel guests probably get to wake up to the scent of fresh baked goods every single morning! 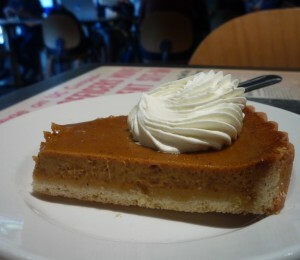 Strada’s pumpkin tart doesn’t stand out as a particularly exceptional dessert, but it’s a solid choice if you’re looking for a treat that puts you in the holiday mood. It’s a decent-sized slice (and for roughly $3.60 apiece, we’d certainly hope so) that hits the spot. And of course, we have to give mad props to Strada for also supplying the Free Speech Movement Cafe with their pumpkin goodies — if it weren’t for them, our on-campus hankerings would simply gnaw away at us until we could get ourselves over to Strada. Both times we payed Crixa  a visit, their pumpkin pie had already sold out. We feel as though that probably speaks to the desirability of the pie, so even without having tried it first-hand, it’s safe to say that Crixa’s pumpkin pie has got to be pretty damn tasty. To compensate for the disappointing lack of pie, we were forced to satisfy our pumpkin craving with a pumpkin spice cake (poor us). Laden with crunchy walnuts and with a fabulously gingery bite, this gem could convert even the most devout of pie people. Each $3.95 slice is large enough to share with one or two lucky friends (though you might just want to be selfish and treat yourself to a whole slice) and with a healthy dollop of freshly made whipped cream ($1 extra, but totally worth it), you’ll be in dessert heaven. And yes, we know that a walk to Crixa can feel more like a trek in the blustery weather that Berkeley’s been experiencing, as of late, but we’d encourage you to grab a sweater and head on over anyway. Don’t dawdle, though! When Crixa sells out of items for the day (sometimes as early as 2 p.m.), that’s it, folks, so arrive early if you want to guarantee that your trip to Crixa will be worth the walk. Don’t be fooled by the name, because Nation’s  is known not only for their giant hamburgers, but also for pies. And that just fits right in with today’s theme, doesn’t it? We headed over to investigate what Nation’s pumpkin pie brought to the table, and discovered that the Nation’s pie is kind of like the standard. The pie by which other pies are measured. Not because it’s exceptional, no, no, but because it’s perfectly average. The “pumpkin cream pie” that we tasted started with a standard butter crust–a little bland and not quite as flaky as some of the others we’d tried. Moving inward, the density of the filling reminded us of a sweet potato pie, and the spices complimented each other nicely. No one spice stood out above the rest, creating an enjoyable (though unexciting) evenness and predictabilty to the eating experience. Sometimes you see desserts that are so beautiful and so perfectly decorated that you don’t even want to eat them. And then you do eat them, and they’re delicious. 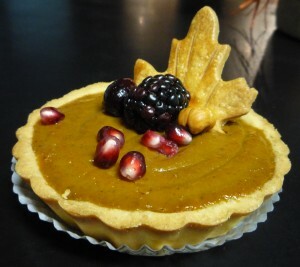 Well, Masse’s  pumpkin pie is just like that — it’s a treat for the eyes and the tastebuds alike. Topped with an assortment of berries, pomegranate seeds, nuts and leaf-shaped shortbread cookies, it’s easy to think that this pie is purely for show. But unlike most showy desserts, Masse’s pumpkin pie has a deliciously creamy filling that even manages to exceed its gorgeous exterior. The filling is the smoothest we’ve had yet, with hints of nutmeg, cinnamon and ginger enhancing the pumpkin flavor, and a splash of rum adds a subtle flavor that speaks to a more mature audience. To top it off, each pie is prepared in a French-style crust so that there’s no ugly pie pan taking away from the perfection that is Masse’s pumpkin pie. The buttery crust holds its form well and melts in your mouth once you bite in. It’s crumbly and not too sweet–an ideal container for the pie’s filling. You can purchase a full pie for $28 or a miniature version (serves one or two) for $5. The Clog understands that this seems overly indulgent and that it’s hard to justify spending so much on a student budget, but Thanksgiving is all about being indulgent! Trust us when we say that Masse’s crafts the most delicious pumpkin pie we’ve ever tasted, and by this point, we’re pretty much experts on the subject. 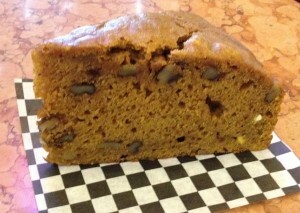 Now, you don’t need to be in the Gourmet Ghetto to get your hands on something pumpkin-y and delicious. For those who live in the College Avenue neighborhood, The Beanery  is a convenient little coffee shop with plenty of tasties to tickle your tongue. And since it’s November, we’d recommend you forgo the standard coffee-and-a-bagel and buy a pumpkin cobbler bar, instead. We’ll admit, the bar isn’t the most gorgeous thing in the world, but take a bite–you won’t be disappointed. As your teeth sink through the layers of crumbly topping, pumpkin filling and pecan pieces, you might very well be reminded of a traditional pumpkin pie, which goes to show just how spot-on the flavors are in this little morsel. We loved how the pecans and cobbler topping add some texture to an otherwise soft dessert and that the hearty dusting of powdered sugar gave just enough sweetness. Bonus points for being easily transportable, too (you can eat it with your hands)! If you’re looking for a pie to bring to your Thanksgiving dinner that’s tasty enough to impress but not so fancy that you can’t fool people into believing that you made it yourself, Virginia Bakery is the place to go. Here, simplicity is key; their pies are of the traditional variety, reminiscent of the ones that Mom makes every year from that recipe that Grandma gave her. Virginia Bakery’s pie has the strongest pumpkin flavor of all the ones we tasted and its crust has a uniquely wheaty taste to it (a pleasant departure from the graham cracker style or butter crusts that have become so popular).